Dynamite is a convenient product that delivers what it promises. This controlled-release plant fertilizer keeps working for up to 9 months and provides both macro & micro nutrients. 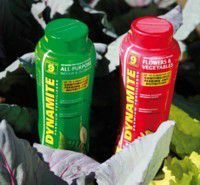 Although controlled-release fertilizer has been available for some time now, Dynamite is new to the consumer market. It used to be sold just to professional growers under the name Nutricote. There are 3 formulas for home gardeners: warm, mild & cool climates. The fertilizer is the same, but the controlled-release coating is adjusted for variable factors, especially soil temperature. One application keeps feeding plants for 9 months. Three different formulas for different climates (hot, mild, cool). Contains macro and micro nutrients. Low in phosphate & No urea to run-off. Not organic - doesn't feed the soil. The shaker hole on the canister is too small. A controlled-release fertilizer with blends for warm, mild & cool climates. Keeps working in soil temps up to 77 degrees F.
In addition to N-P-K, contains all the micro nutrients (boron, copper...) necessary for healthy plants. Lasts 9 Months. The coating agent that controls the fertilizer was developed for Japanese rice paddies and is unaffected by excess water. This polymer resin shell biodegrades completely. You won't have empty shells in your soil for years to come. Available in formulas for Flowering and Fruiting Plants, Foliage Plants and Ailing Plants. Suggested Retail: $4.97 / 1 lb. or $8.99 / 2 lb. Controlled-release fertilizers are coated with a permeable substance that controls the dispersal of the fertilizer. Water enters the granules and releases fertilizer as it leaves. Some controlled-release fertilizers can have uneven dispersal rates, dumping all the remaining fertilizer when temperatures go up or after a downpour. Dynamite's protective resin coating prevents cracking and fertilizer dumping. Dynamite claims its coating will retain this property in soil temps up to 77 degrees F.
Dynamite's not an organic fertilizer, which would feed the soil and not the plants, but Dynamite also doesn't hurt the soil. In fact, it won and EPA award. It's slow release nutrients go right to the plant's roots. This is especially nice for containers, where you're probably using a soilless mix and forcing your plants to bloom all summer long. Since Dynamite lasts up to 9 months, flowering plants won't give out mid-season. In garden beds, the use of ammoniacal nitrogen rather than urea means less nitrogen run off. Nitrogen is water soluble, so excess is easily washed out of the soil. It runs off and pollutes the ground water supply. Ammoniacal nitrogen can be taken up by the plants immediately. It doesn't need to break down further, like urea. I did a test this spring on some coleus cuttings: half got Dynamite and half another controlled-release fertilizer. Both did about the same initially, so I was skeptical. Once I moved the plants outdoors, the Dynamite plants took off. Dynamite costs a bit more than other controlled-release fertilizers, but it won't need to be reapplied or supplemented since it has all the nutrients your plants will need. I still prefer building your soil, but there are times when convenience is hard to argue with and Dynamite combines convenience with results. How Do You Use Milk to Control Powdery Mildew?